Tag Archives: Golden Dolly Death Dust! 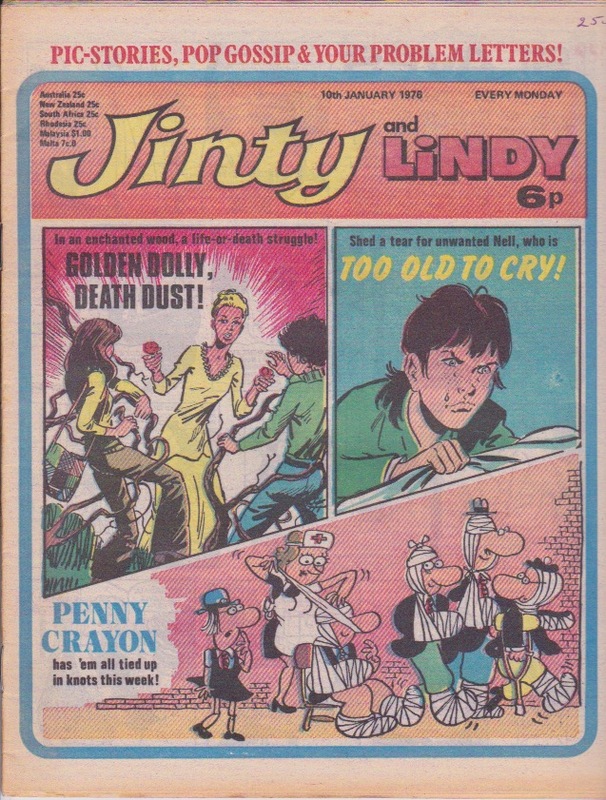 I have recently received a few 1975 issues of Jinty, which I will write individual issue posts about in due course as usual. Before that, I wanted to write a little bit about the memories triggered by seeing these issues again for the first time in many years. I’ve seen the cover images on Catawiki or similar, and they didn’t particularly lead me to feel that I remembered what the contents were going to cover. Indeed, when starting to read issues 42 and 51, practically none of it triggered any memories from when I was little – “Tricia’s Tragedy”, “The Kat and Mouse Game”, and the end of “Bird-Girl Brenda” rang no bells at all. 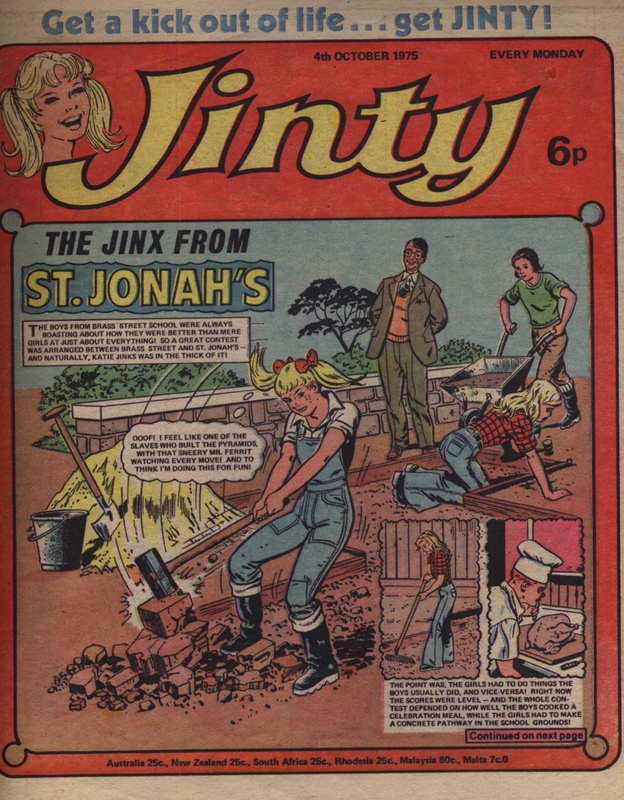 But looking inside the issue dated 26 July 1975 was a different matter: of course the front cover with Katie Jinks’ antics was familiar, but so was the inside story of her circus exploits – I wouldn’t have been able to remember it in advance but looking at it again I felt I knew it well. The next story was “Blind Ballerina”, much more familiar to me than “Tricia’s Tragedy” – as I read each page it felt as if it was flooding back to me, not just the plot (which I could have got from Mistyfan’s post on this issue) but the individual panels and the dialogue boxes themselves, too. Likewise with “The Valley of Shining Mist” – the very first panel of it gave me a shock of recognition, as ‘Dumbie Debbie’ stumbles tearfully away from the poetry reading competition she has been asked to take part in. It is like when Mistyfan sent me a scan of the episode of “Golden Dolly, Death Dust!” from the issue dated 1 November 1975, which I have also just received recently – but until she sent me that scan some months ago now, I hadn’t seen the episode since I was perhaps ten years old or so, and yet the snippet of dialogue where evil witch Miss Marvell poisons the buddleia in the school grounds has lived in my mind ever since then. My six-year old daughter has taken to reading my old Jintys now (and Sandies, and anything else I leave lying around). She’s enjoying them greatly and can hardly be torn away from them for suppertime and the like. I hope for her sake that when she is my age, she will not just have vague fond memories of this childhood reading, but ingrained snapshots in her mind that are subtly longer-lasting than you could ever have expected – unless of course you hadn’t already had it happen to you.